In a deep fryer or deep skillet, heat oil to 350 F or until hot. In a large bowl, beat eggs, milk, and vanilla. Sift flour, sugar, baking powder and salt. Add to egg mixture; stir until dry ingredients are moistened and dough is smooth. 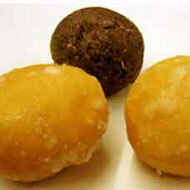 Drop teaspoonfuls of dough into the hot oil; fry until golden brown and doughnuts rise to the surface. Drain on paper towel lined plates and serve hot, but they are also good cooled down, you can buy them either way there on Okinawa!